Accurate results are what Quickshot XRF users want from their investment – and that is what our x-ray fluorescence analyzers provide. However, there are a number of variables that can affect the performance of any brand of XRF analyzer. One of the most frequently overlooked and most critical factors in obtaining the highest accuracy from an XRF instrument is having good quality calibration (or reference) standards. The XRF analyzer will only measure a sample as accurately as the standards that the instrument was calibrated with. All XRF analyzer’s need to be recalibrated periodically due to electronic component change – when enough change is noted, the instrument can no longer adjust accordingly to compensate for the difference. Reference standards should be checked daily to verify accuracy. That is why Quickshot XRF has teamed with an Accredited Standards Laboratory to offer users of the QSX-79T and QSX-295T reference standards for gold and precious metals analysis. The most common standards utilized are sets of white and yellow gold; which include 10k, 14k and 18k standards (yellow includes 22k). Standards for users of the QSX-HH handheld analyzer will vary. Systems for the most popular application, hazardous substance detection, come with appropriate standards. Other applications, including geological/soil analysis and precious metal identification require standards that are customized to the users detailed interest; which we can offer. to discuss your interest in maintaining the accuracy of the Quickshot XRF system. As noted in a previous blog entry, the good people at California Watch are renting a Handheld XRF Analyzer from QSX Instruments to provide public lead screening events. The websites editor, Mark Katches, also used the system to test his sons toy trains and wrote a nice article about his concerns, his use of x-ray fluorescence and the screening results. While California Watch covers a wide range of topics affecting the public and they have recently had a few articles covering lead/cadmium issues, product recalls and their own screening events. Utilizing a Quickshot XRF Handheld Analyzer (QSX-HH), California Watch will be providing free screening of jewelry at three different locations in the Southern California region throughout early October. Details of the screening events can be reviewed here. The California Watch team was launched by the Center for Investigating Reporting in 2009. As noted on the California Watch web-site, the team “pursues in-depth, high-impact reporting on issues such as education, public safety, health care and the environment”. They have had several articles regarding hazardous substances (lead, cadmium) in jewelry including this article about a national retailer that continues to violate lead laws (Proposition-65, CPSIA). Refer to the California Watch website with questions on the free screening events or their reporting on this important issue. 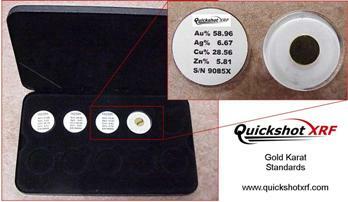 Feel free to contact Quickshot XRF about our solutions for testing product for lead, cadmium, etc. A new page has been added to the Quickshot XRF website that allows visitors to request a variety of literature. - An overview of the QSX-79T and QSX-295T; detailing the minor differences in configuration, performance, etc. Future literature will include more spec sheets on the available x-ray fluorescence analyzers, white papers on specific industries and application notes detailing popular uses of XRF technology. We are also working with several outside organizations to offer literature from them that may be of interest to you…so check back often. Literature can be requested through this link.